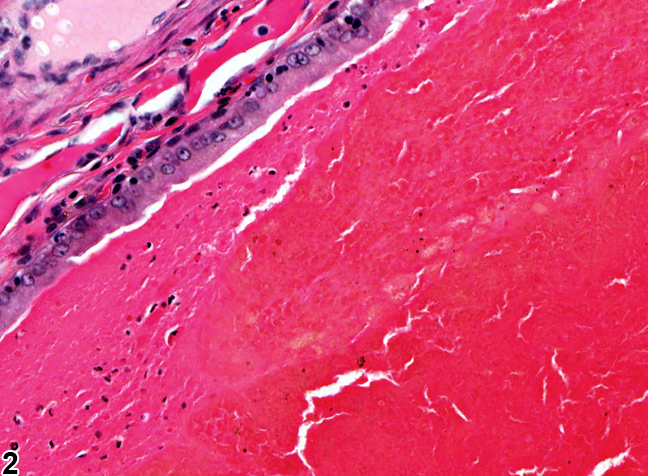 Uterus - Hemorrhage in a female F344/N rat from a chronic study. There is accumulation of blood in the uterine lumen. 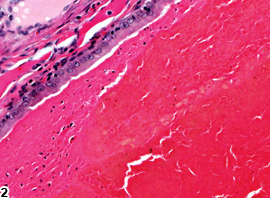 Uterus - Hemorrhage in a female F344/N rat from a chronic study (higher magnification of Figure 1). There is hemorrhage in the uterine lumen. Uterine hemorrhage ( Figure 1 and Figure 2 ) is seen occasionally in rats and mice. It is often associated with mononuclear cell leukemia in F344 rats. 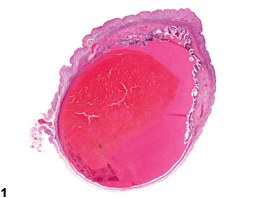 When chronic hemorrhage occurs, hemosiderin-laden macrophages, cholesterol clefts, dystrophic calcification or mineralization, and fibrosis may be evident. This may occur in the lumen, endometrium, and/or myometrium. 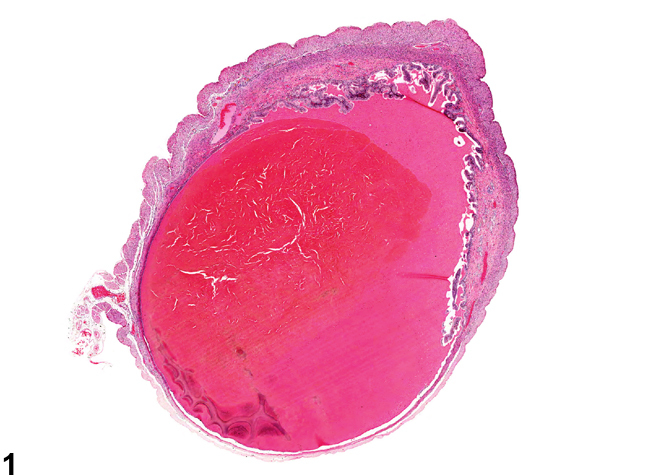 Uterine hemorrhage must be carefully examined for evidence of endothelial proliferation that would indicate the presence of an underlying process, such as endothelial hyperplasia, hemangioma, or hemangiosarcoma. Uterus - Hemorrhage should be diagnosed and graded. If it is secondary to another process (e.g., inflammation, neoplasia), it should not be diagnosed unless warranted by severity but should be described in the pathology narrative.